During the course of history many composers have been attracted by the text of the Stabat mater. Its author is unknown, but it is assumed it was a Franciscan monk from the 13th century. During the 15th century it was part of the liturgy but was then banned from the Church. It is most remarkable for its emotive language, reflecting the intense emotions of the Virgin Mary at the foot of the Cross and the feelings her emotions evoke in the hearts and minds of the faithful. Its emotional character was exactly the reason that the Church thought it inappropriate for liturgical use. The most famous setting of all times is the one by Giovanni Battista Pergolesi. He composed it shortly before his death. At that time the Stabat mater had refound the approval of the Church. In 1727 Pope Benedict XIII sanctioned its use for the Feast of the Seven Sorrows in Lent. However, Pergolesi's setting was not intended for the Church. It was commissioned by the Knights of the Virgin of the Seven Sorrows, a Neapolitan confraternity which previously had performed a setting by Alessandro Scarlatti every year. The two settings share the same scoring: soprano and alto with strings and basso continuo. The popularity of the Pergolesi dates from almost immediately after its creation. There are plenty of expressions of admiration for the piece from the 18th century. However, it was also the subject of criticism, especially because of its operatic character. The way Pergolesi set the text can still make people knit their brows. It is therefore important to understand the way the text is depicted in the music. In his liner-notes Simon Heighes makes some useful remarks in this respect. There is also a second issue here. It is true that this setting bears the traces of opera. However, as Heighes emphasizes, it is exactly the galant Neapolitan operatic style - of which Pergolesi was one of the most prominent representatives - which allowed to set the text of the Stabat mater in this manner. "The directness of expression and transparency of texture which served him well in the theatre were now used to bring immediate impact and melodic variety to the long lament of the Stabat mater". This could well be one of the main reasons for its unbroken popularity. One doesn't need to sit through endless dacapo arias with extended coloratura. There are many moments where the text is graphically illustrated in the music, for instance the scourging of Jesus (Quis est homo) or the burning of the heart of the faithful (Fac ut ardeat cor meum). This work's popularity is reflected by the large number of recordings which are available. I don't know all of them, but over the years I have heard quite a number, and very few really satisfied me. Sometimes the operatic character tempts the performers to sing it as if it is a real opera. There are plenty of recordings with big voices, often with a wide vibrato, which don't blend at all, and an exaggerated dramatic approach to the instrumental score. On the other hand, some performers go so far in trying to avoid this kind of aberration that they produce a rather flat and unexpressive interpretation. Apparently it is not easy to find the right approach. The performers here have come quite close. First of all, Julia Lezhneva and Philippe Jaroussky are an ideal match. Their voices not only blend perfectly, sometimes you can hardly tell them apart. That lends their performance a sense of unity which I have seldom heard in this work before. They are very responsive to the text: every nuance which Pergolesi used to illustrate the text is conveyed. The opening section is often admired for its use of harmony at the service of the text. That comes off to great effect due to the avoidance of vibrato by both singers. Here and elsewhere the appoggiaturas are stretched to the maximum which creates moments of great harmonic tension. O quam tristis is just one example of intense expression, whereas the sufferings in the next section (Quae moerebat) are vividly exposed. The orchestra also makes its contribution, although I wonder whether sometimes it goes a bit too far, for instance in the dynamic outbursts in Cujus animam gementem. This is partly the effect of the line-up of I Barocchisti. According to the booklet it comprises eight violins. That doesn't imply that all of them are playing here, but the venue where the Stabat mater was first performed strongly suggests that a performance with one instrument per part is most appropriate. The use of more than single strings is the only questionable aspect of this performance. In addition to the Stabat mater only ten sacred works from Pergolesi's pen are known. Among them are the two Vesper psalms which are recorded here. Confitebor tibi Domine may have been performed during a three-day festival of prayer in Naples at the end of 1732, on the occasion of an earthquake which shook the city the year before. This setting of Psalm 110 (111) is scored for two solo voices, five-part choir, strings and bc. The solo parts are both for soprano; it speaks volumes for Jaroussky's tessitura that he has no problems with his part at all. The work is divided into a number of sections. The opening quotes the plainchant melody of this psalm which is repeated in the 'Sicut erat'. In the closing 'Amen' the soloists suddenly intervene with virtuosic coloratura. Laudate pueri Dominum is considered a late work, and the strings are joined by oboes and trumpets. According to the first page of the booklet it includes solo parts for soprano and alto, but in fact there is just one solo soprano part which in this performance is divided among Lezhneva and Jaroussky. It comprises seven sections; two of these are for solo voice, in three the soprano is joined by the choir. The solo sections of this Psalm are more operatic than the Stabat mater and include cadenzas. These two works are not that well-known and that makes their inclusion most welcome, especially if they are sung so beautifully. The choral parts are performed very well; the choir is agile and its sound transparent. The two soloists give fine accounts of their parts. However, I have to mention something in regard to Ms Lezhneva which I have also noticed in my review of her disc "Alleluia": her trills sometimes sound a bit harsh, almost like a hard tremolo. This seems especially to happen when she sings at high speed. That is a pity because it is not pleasing to hear. In the booklet Diego Fasolis announces a recording of two other sacred pieces by Pergolesi. That is something to look forward to. 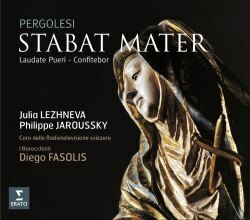 For the time being let us enjoy this fine disc with what has to be considered one of the best recordings of the Stabat mater in the current catalogue.